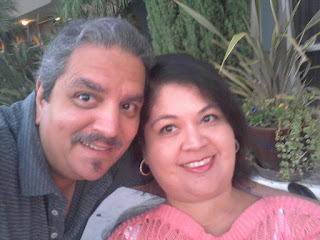 My name is Nicole Diaz, song creator and "love-bringer!" I’m 47, disabled, and passionate! My story is about going from powerless to powerful. As a girl, I wanted to live my life with profound purpose. I was born with Spinal Muscular Atrophy, a degenerative condition affecting muscle strength and movement. I’ve been in a wheelchair my entire life. I'm second generation in my family to be born in America with grandparents that come from Mexico. Both my parents were working class and promoted higher education. Coming from a disadvantaged home, I gained a survivor’s strength. I learned how to be proactive while vulnerable. My parents constantly reminded me that my disability was not an excuse. At 19, my family roots scattered and I was left to discover just how strong I really was. I learned that I despised defeat and solutions were all around me. Whether that meant finding help out of bed or traveling in my chair for miles to get to a gig, I began to believe I was bigger than just surviving! I believe as disabled women it’s crucial we take charge over defining ourselves. In exploring what kind of “special” I could bring to this world, I tried various career choices like working with underprivileged youth at summer camps. Here is where I discovered that it gave me joy promoting awareness and compelling people to love; yet there was always one gift that fulfilled my heart when breaking barriers and uniting people: writing songs and singing. In 1982 at summer camp, someone discovered that I could sing and I was prodded to perform in the camp talent show. Being only thirteen years old I was unaware that my voice was a talent. This discovery began to produce opportunities to perform. My platforms include the Jerry Lewis Telethon in Los Angeles and Knott'sBerry Farm. At age 26 I wanted to take my career to the next level so I attended the Christian Music Artist Seminar in 1996 in Estes Park. Colorado. Here I was introduced to my producer from Nashville, Jeff Nelson, who's had the privilege of producing projects for artists such as John Elefante and Cindy Morgan. He immediately began suggesting that I write and sing my own album as an independent artist. Jeff had such a heart in seeing me as an artist rather than defining me by my disability that I knew he was the right man for the job. Soon after I begin to write my first songs. With a deadline set to get into the studio, we faced an obstacle with the disability, traveling to Nashville to record my vocals. It was winter and going to be difficult. It was decided for me to record in Los Angeles where I was introduced to Dan Garcia, a world-renowned producer who’s produced artists such as Christina Aguilera, David Cosby and Jadakiss. Dan has become a lifelong friend and, to this day, someone who's played a major role in connecting me to my network in the entertainment industry. By the year 2000 my album was complete and it was time to start performing. Knowing I’d face challenges, I took on a “can-do” motivation because music was and still is my purpose and passion. I experienced everything from inaccessible venues to public transportation failures, where I was forced to miss a gig. Sometimes I even had to take a long walk in my power chair to a gig then back home again. But the love in people’s eyes and my hope to inspire instantly became a purely magical combination. I saw how my music fostered a quality that made it easy for others to relate to me on a human level. Inclusion came readily, encouraging a passion that I knew had to be ten times more effective than that of an able-bodied musician. I’ve been one lucky gal to have happened upon great supporters and influences along my journey. My biggest support has been my husband. October 4th, 2015 my husband had a massive heart attack and never recovered from a minimally vegetative state. He’s been in and out of hospitals and nursing facilities since then. I’ve been advocating for him and I visit him twice a month, as well as pursue my careers. Andrew and I married in 2002. He has been a lifeline to the development of my own self belief and motivation. He was the heart I needed any time doubt set in. It pushed me to venture into other areas of interest like writing and disabled advocacy work. I belong to an Arts & Media organization called The GreenHouse where I network and learn with authors and film writers for Hollywood. I’m currently working on two novels and my autobiography. 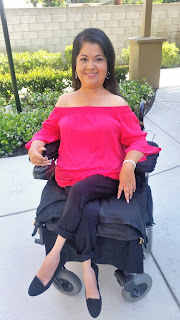 Also I most recently was accepted to be a member on the Board of Directors for CALIF, an independent living center that services the DTLA region for disabled people. 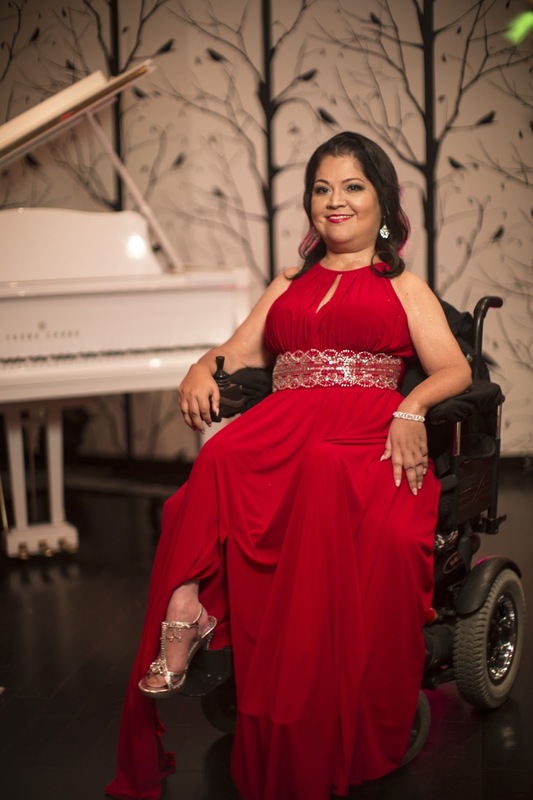 I am RAW Beauty (The Raw Beauty Project) because today, although Spinal Muscular Atrophy has weakened my ability to sing causing me to retire from performing in 2006. Today I work hard at presenting my songs. I currently am part of the Singer/Songwriter network in Los Angeles. They’ve been like a family to me helping me grow in my craft and my passion. I work hard at offering all my talents to several platforms and know that one day the world will hear. I hope to inspire other disabled persons to be honest with themselves at all times, don’t back down from your challenges, find your gifts and pursue them with fierce passion. That’s how one can go from being powerless to powerful! I continue chasing my dream as a song creator/love-bringer. To contact Nicole Diaz, e-mail nikabilities@gmail.com.